In honor of July 1st I thought I’d tell you about a relatively unknown brassica that is hot on the food scene. This is one you can grow for yourself or a plant that you may want to grow to sell (it’s a hot item in the big city restaurant scene). So what is spigariello and what do you do with it? It’s technical name is Brassica Oleracea and it’s a leaf broccoli that’s grows similar to how broccoli rabe grows. 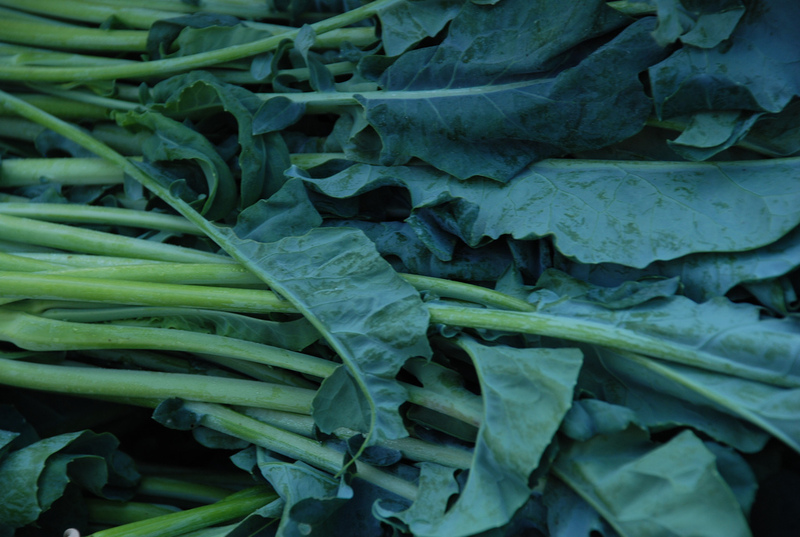 The difference is unlike broccoli rabe, spigariello is sweeter and less bitter, tasting more of broccoli and kale. What to do with Spigariello? Why would you want to grow this strange broccoli that doesn’t make heads? You can plant in July and enjoy this versatile plant until a heavy frost for one. The leaves are great raw for salads, wilted with some olive oil, garlic and red pepper flakes (my favorite) or in a stir fry. They wilt more than chard but less than kale or collards. I’d suggest trying them in a nice bean dish, anyone up for ribollito? I buy mine from Terrior Seeds and according to their website, they have seeds in stock and ready to ship at once. They are also available at Johnny’s Seeds. Mariquita Farm down near Watsonville, CA is a wonderful CSA that supplies Silicon Valley and the San Francisco Bay area heirloom and specialty crops and they grow Spigariello and have a wonderful recipe. You can find a little more about spigariello at the Farm Project blog too. We suggest ordering some seeds and getting this crop in the ground. We’re really hoping to see some show up at our local Corvallis Farmer’s Market this fall. Photo credit goes to Kristen Taylor; Flickr creative commons Spigariello at the Union Square Greenmarket.